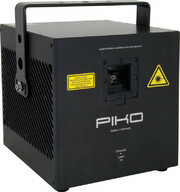 The RTI PIKO Series provide high-end show laser systems in extremely compact housings. 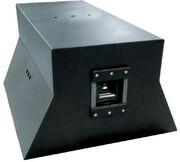 These series combine high power with great precision in a small cube of only 25 cm per side and a low weight of ca. 13kg. 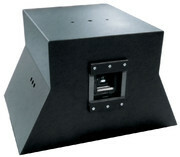 The RTI PIKO laser systems combine extreme power with very high accuracy and super small size. This makes the PIKO units suitable for any kind of application - fixed installations, mobile use, multimedia projects, long distance outdoor applications and extra precise graphics projections. Basic settings can be carried out by means of the detachable remote control pad. Standard control is through ILDA, but all PIKOs can optionally be operated through LAN, DMX, SD-card, stand-alone mode or even W-DMX. 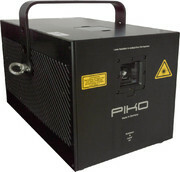 RTI PIKO show laser lights are 'Made in Germany' in a durable, dustproof built housing, which is perfectly suitable for challenging show laser applications. 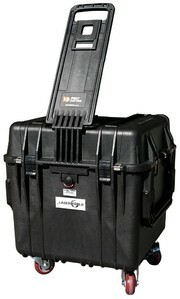 The devices are equipped with very fast scanners and diode laser modules. Despite the RTI PIKO RGB 11 all other units also have green Coherent Taipan OPSL modules. The RTI PIKO G and PIKO RGB 11 are suitable for the RTI VELOX system, the world´s first laser moving head with unlimited PAN and TILT. Different variants are available: from classical RGB units with power up to 14W, single green high power systems with up to 24W OPSL, to special solutions like whitelight systems with Yellow+Blue or Yellow+Cyan assemblies. Even individual configurations are possible: solutions with up to 2 different OPSL modules (except red) or diode modules (in red and blue) or also combinations with green DPSS sources. All PIKO systems are standardly equipped with extremely fast and highly angle-stable CT-6210HP SE scanners. The scanners are manufactured by Cambride Technologies, the special driver comes from Ray Technologies - and, in addition, assures increased efficiency. The control of the PIKO systems is based on the ILDA standard protocol, additional upgrades allow optional control via LAN, Stand-Alone Mode, DMX or W-DMXTM. By default, all PIKO systems feature a multifunctional Touchscreen Remote Pad. The removeable remote control provides different functions, such as settings of color-balance and brightness, scanner setups or an overview over the system's general operating status. It comes with a safety button and key switch. The Remote Pad can be extended via LAN cable, so it is possible to operate the laser from a larger distance. According to IP54 the housing of the PIKO Series is dust-proof and protected against splashing water, which makes the units suitable for a multitude of different applications. It is made of highly durable aluminium. Optical components as well as control electronics are integrated dust-proof. Cooling is assured by a central heat sink, that is supported by temperature-controlled fans, if necessary. 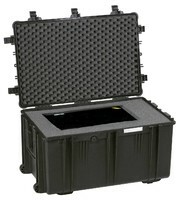 For a safe PIKO transport we offer a robust flightcase, which is air-, dust- and waterproof: the original PELI Case. The Dark Weather Rain Cover is specifically designed for PIKO units and provides perfect ventilation and rain protection. The RTI Laser Spin is a special moving yoke for PIKO units. The Laser Spin supports fast pan and tilt drives and enables ILDA control of the PIKOS while they are moving.